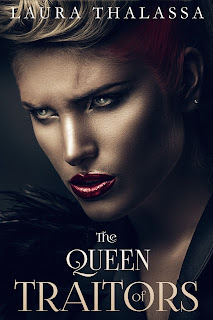 The Official Website of Laura Thalassa: The Queen of Traitors (The Fallen World, #2) is Out Now! The Queen of Traitors (The Fallen World, #2) is Out Now! I can’t believe the day is finally here! It’s been a long, agonizing year, but TheQueen of Traitors (The Fallen World, #2) is finally available! You can find it here. The print version should be out by the end of January. I hope you enjoy serenity and Montes’s love/hate story. I had wicked fun writing it!! "Even now I want to wrap myself up in her and make her the air I breathe and the earth I stand on. But she’s not earth or air. She has been and always will be fire. She’s my light and my death, and I couldn’t escape her unscathed even if I tried."